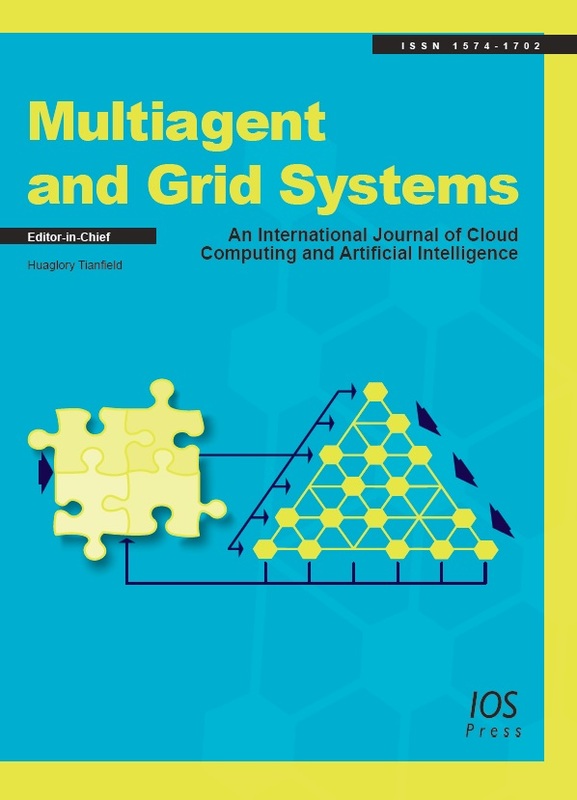 Multiagent and Grid Systems – An International Journal of Cloud Computing and Artificial Intelligence aims to provide a timely and leading forum for researchers and practitioners in the thematic areas of intelligent agents, multi-agent negotiation and collaboration, cloud computing, cloud datacenter, big data, data-driven artificial intelligence, cloud enabled artificial intelligence, AI based cloud computing. It publishes peer-refereed research and application papers of high technical quality and scientific standard. The journal features original research papers, comprehensive and sound survey papers about the state-of-the-art, technical papers about implementation issues of general interest, applications and field works. Moreover, from time to time it presents special issues on contemporary problems of profound research challenges in its thematic areas. Authors who want to submit manuscripts to MAGS International Journal should go to the online submission system and follow the instructions thereon. Any query about using the online submission system can be sent to mgs@siwn.org.uk. - Separate files of all figures (if any); see "Preparation of manuscripts" for the required file formats. - The text of an accepted article should be plain formatted, e.g., 1.5 line spaced, one column, 12 point font, A4 paper with proper margins in top/bottom and left/right-hand sides. It is possible to have figures printed in colour, provided the cost of their reproduction is paid for by the author. See Preparation of Manuscripts for the required file formats. The IOS Press Open Library® offers authors an Open Access (OA) option. By selecting the OA option, the article will be freely available from the moment it is published, also in the pre-press module. In the Open Library® the article processing charges are paid in the form of an Open Access Fee. Authors will receive an Open Access Order Form upon acceptance of their article. Open Access is entirely optional. Manuscripts must be written in English. Authors whose native language is not English are recommended to seek the advice of a native English speaker, if possible, before submitting their manuscripts. Peerwith offers a language and copyediting service to all scientists who want to publish their manuscript in scientific peer-reviewed periodicals and books. Manuscripts should be prepared with wide margins and double spacing throughout, including the abstract, footnotes and references. Every page of the manuscript, including the title page, references, tables, etc., should be numbered. However, in the text no reference should be made to page numbers; if necessary, one may refer to sections. Try to avoid the excessive use of italics and bold face. Headings and subheadings should be numbered and typed on a separate line, without indentation. SI units should be used, i.e., the units based on the metre, kilogramme, second, etc. - The use of first persons (i.e., "I", "we", their possessives, etc.) should be avoided, which can nicely be expressed by the passive voice or other ways. This also applies to the Abstract. -+ Part Four is critical evaluation against related works, and the conclusion. - A survey paper may skip Part Three, but should multiply Part Two and elaborate Parts One and Four. - An application paper may light touch Part Two but should elaborate Part Three, with Parts One and Four similar to what a research paper would. In any article it is unnecessary to have an arrangement statement at the beginning (or end) of every (Sub-)Section. Rather, a single overall arrangement statement about the whole paper can be made at the end of the Introduction Section. Number as Table 1, Table 2 etc, and refer to all of them in the text. Each table should be provided on a separate page of the manuscript. Tables should be embedded in the text. Each table should have a brief and self-explanatory title. Column headings should be brief, but sufficiently explanatory. Standard abbreviations of units of measurement should be added between parentheses. Vertical lines should not be used to separate columns. Leave some extra space between the columns instead. Any explanations essential to the understanding of the table should be given in footnotes at the bottom of the table. Number figures as Figure 1, Figure 2, etc and refer to all of them in the text. Each figure should be provided on a separate sheet. Figures should be embedded in the text. Colour figures can be included, provided the cost of their reproduction is paid for by the author. Figures should be designed with the format of the page of the journal in mind. They should be of such a size as to allow a reduction of 50%. On maps and other figures where a scale is needed, use bar scales rather than numerical ones, i.e., do not use scales of the type 1:10,000. This avoids problems if the figures need to be reduced. Each figure should have a self-explanatory caption. The captions to all figures should be typed on a separate sheet of the manuscript. Photographs are only acceptable if they have good contrast and intensity. B. Newman and E.T. Liu, Perspective on BRCA1, Breast Disease 10 (1998), 3-10. D.F. Pilkey, Happy conservation laws, in: Neural Stresses, J. Frost, ed., Controlled Press, Georgia, 1995, pp. 332-391. E. Wilson, Active vibration analysis of thin-walled beams, Ph.D. Dissertation, University of Virginia, 1991. Footnotes should only be used if absolutely essential. In most cases it is possible to incorporate the information in the text. If used, they should be numbered in the text, indicated by superscript numbers and kept as short as possible. Authors submitting a manuscript do so on the understanding that they have read and agreed to the terms of the IOS Press Author Copyright Agreement. An author, when quoting from someone else's work or when considering reproducing figures or table from a book or journal article, should make sure that he is not infringing a copyright. Although in general an author may quote from other published works, he should obtain permission from the holder of the copyright if he wishes to make substantial extracts or to reproduce tables, plates or other figures. If the copyright holder is not the author of the quoted or reproduced material, it is recommended that the permission of the author should also be sought. Material in unpublished letters and manuscripts is also protected and must not be published unless permission has been obtained. Submission of a paper will be interpreted as a statement that the author has obtained all the necessary permission. A suitable acknowledgement of any borrowed material must always be made. The corresponding author will receive a PDF proof and is asked to check this proof carefully (the publisher will execute a cursory check only). Corrections other than printer's errors, however, should be avoided. Costs arising from such corrections will be charged to the authors. The corresponding author of a contribution to the journal will receive a complimentary PDF Author’s Copy of the article, unless otherwise stated. This PDF copy is watermarked and for personal use only. A free PDF copy will not be provided for conference proceedings and abstract issues. An order form for a PDF file without watermark, reprints or additional journal copies will be provided along with the PDF proof. If you wish to order reprints of an earlier published article, please contact the publisher for a quotation. IOS Press, Fax: +31 20 687 0019. Email: editorial@iospress.nl. An author is entitled to 25 % discount on IOS Press books. See Author's discount (25%) on all IOS Press book publications.